Learn how acupressure can help relieve eye conditions such as pain, strain, and irritation. Thankfully for all of us allergy sufferers, the healing power of acupressure extends to cover our eye irritation as well. Acupressure heals the body by balancing our meridian energy system. This balanced energy then flows through the body and relieves us of our physical ills. The healing power of our meridian energy extends to our eyes as well. People who suffer from various eye conditions, such as pain or strain in the eyes, can find relief with the regular use of acupressure. Acupressure can also help relieve bloodshot eyes, itchiness of the eyes, and many other conditions. The healing power of a balanced meridian acupuncture system may even help to improve your eyesight by remedying whatever negative health condition caused it to deteriorate to begin with. This is possible because our inner energy system affects our entire body. Every cell in our body will perform its function more fully when our energy system is brought into balance and our energy flows freely and fully. Let's take a look at the acupressure points you can use today to help relieve the problems that are affecting your eyes. 1. 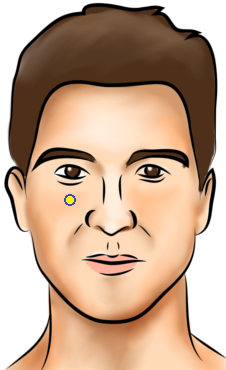 Bladder 2, found on the face, located on the inner tip of the eyebrow. Use this acupressure point to treat just about anything related to your eyes. It will help get rid of redness of the eyes, pain in the eyes, and hay fever symptoms. It will also help fix foggy or blurry vision, and will even help reduce headaches such as those that involve pain in the muscles attached to the eyes. 2. Stomach 2, found on the face, on the cheek, just half an inch below the bottom of the eyelid. Use this pressure point to relieve burning and aching eyes. It can also be used to reduce sinus pain, headaches, and help alleviate overly dry eyes. 3. Stomach 3, found on the face, on the cheek, about one inch below the bottom of the eyelid, just below the Stomach 2 point mentioned above. 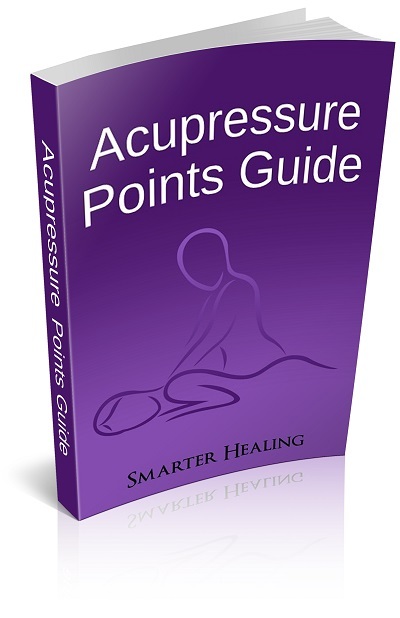 This acupressure point will do much the same that the earlier Stomach meridian point will do. It will help relieve eye fatigue and pressure around the eyes such as sinus pressure that pushes on the eyes. It can also help relieve a stuffy nose from allergies that might be affecting your eyes and the rest of your body. It also helps reduce head congestion in general. 4. Bladder 10, on the back of the head, half an inch below the base of the skull, just to the side of the spine. 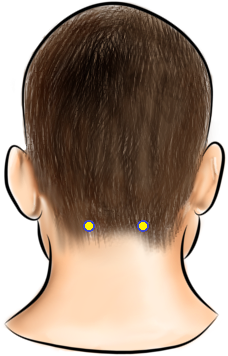 Use this acupressure point on your head to relieve stress and "burnout" feeling often caused by the same sort of allergies and illness that might be affecting your eyes. This pressure point will reduce a heaviness feeling in the head. It will help relieve eye strain and reduce swelling around the eyes. This point is great for relieving exhaustion, especially exhaustion related to illness and allergies. 5. Governing Vessel 16, on the back of the head, in the hollow below the base of the skull, at the top of the spine. This powerful acupressure point will improve the overall health of the entire face. It will improve the health of the eyes, ears, nose, and throat, and help remedy whatever is bothering them. This point also relieves all sorts of mental problems in general. It also helps get rid of headaches. As a Governing Vessel meridian point, it is a powerful acupressure point in general. 6. Governing Vessel 24.5 (between GV 24 and GV 25), located in the middle of the face, above the nose, right between the eyebrows. This is not actually an acupuncture meridian point, as it is located between two other points but not directly on an acupuncture point. However, this point is famous in spirituality for being the location of the "third eye" of the spiritual body or soul within us. Thus, many people believe it has healing power even though it isn't traditionally prescribed in acupuncture treatments. Applying pressure to this point will help benefit the endocrine system of the body. It will strengthen the function of the pituitary gland, which will have beneficial health effects all over the body. This point will also help with your eye problems. It will relieve allergies like hay fever, and also help reduce headache pain and eye strain. 7. Liver 3, found on the top of the foot, located in the indentation between the bones of the big toe and the second toe. Use this Liver meridian point to relieve tired eyes. It will also help alleviate headaches and hangovers.